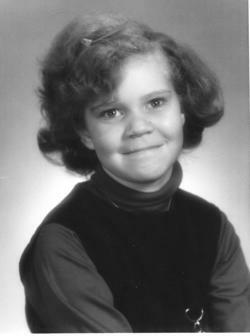 My 4th grade school photo. Looking back, it's not surprising that I became a children's author or that I write books about American history. I grew up the daughter of a college history professor in a town that was packed with history—Lexington, Virginia. I loved writing and reading as much when I was a kid as I do today. Even so, during my childhood I considered many careers in addition to that of an author—everything from school teacher to flight attendant to librarian to veterinarian to politician to playwright. It took years of adulthood and several career changes for me to find my way back to that earliest childhood ambition of becoming a children's author. Lexington's history revolves around the Civil War and its two colleges. Both the Virginia Military Institute and Washington and Lee University have rich ties to the past. During my childhood, history surrounded all my ordinary experiences—from walks to school, to games with friends, to independent prowls. I roller-skated past the chapel where Robert E. Lee is buried. My friends and I collected buckeyes on the campus where George C. Marshall trained for his military career. I visited the museum that displays the stuffed remains (truly!) of Stonewall Jackson's horse. Every breath carried a trace of history. Ties to the past seeped into my pores. Without realizing it, I grew to love history and expect it around every corner. Later on, I was shocked to learn that not all cities came so tightly packed with historic connections! How lucky for me to have grown up in one that did. My schooling included several years of segregated instruction, then, beginning in fourth grade, a switch to integrated classrooms. Those experiences helped inspire me to write about segregation years later in my book Freedom Riders. My favorite childhood hobbies included stamp collecting, gardening, and reading—everything from the Little House books, to Nancy Drew, to the fantasies of J.R.R. Tolkien, to lots of biographies. I still enjoy these pastimes today. My family traveled a lot, too, with plenty of stops at historic places. I even met one historic figure during these years, Alice Paul, whom I would write about many years later in With Courage and Cloth. 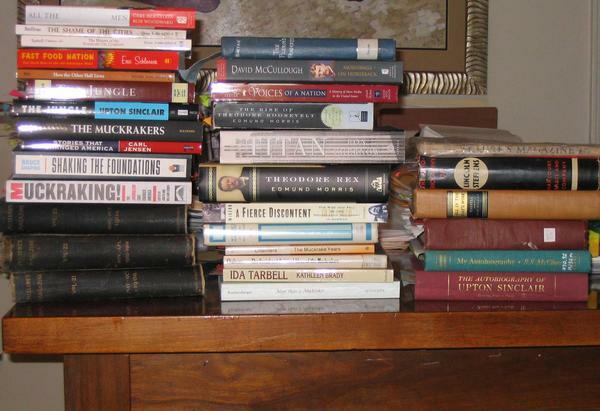 Stacks of books overrun my office during each new research project. Can you guess which topic I explored with these resources? I developed an interest in current events at an early age. My first political memory dates from first grade and the assassination of President John F. Kennedy in 1963. I lived through more history in the years that followed—everything from the Vietnam War to the anti-war movement, from the push for African-American rights to demands for women's equality, from the Watergate break-in to the resignation of President Richard M. Nixon. My youthful curiosity about current events inspired a lifelong enthusiasm for newspapers and journalism. It's no wonder I chose to write about investigative reporting in Muckrakers. High school days, captured by my friend Mary Jo Rhodes. During high school I spent three years at an all-girls boarding school, the Madeira School. We made regular trips from our secluded campus into nearby Washington, D.C., and my love of U.S. history and government took hold as a result. Books like Our Country's Presidents and Our Country's First Ladies connect to these early experiences in our nation's capital. When it came time for college, I sought the chance to explore a new part of the country and enrolled at Beloit College in Wisconsin. I loved the winters I found there, plus great new friends, wonderful professors, the chance to study abroad, and lots of writing opportunities. 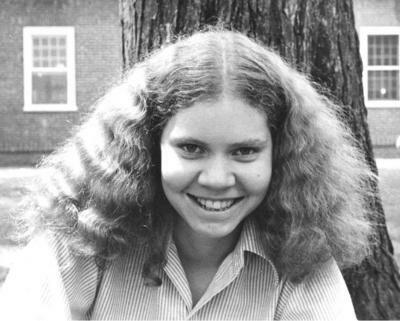 After I graduated from Beloit, I moved to New York City and wrote marketing copy for publishing companies. I helped read the slush pile, too—that mountain of submissions from writers trying to break into the publishing business. Seeing all those unpublished manuscripts made me even more wary of trying to write my own books. Personal ties to a friend from college led me back to Beloit, Wisconsin and married life on an old farmstead. I kept writing, but this time I wrote public relations pieces at my alma mater. One of these writing assignments introduced me to Beloit College alumnus Roy Chapman Andrews and led to my book about him a decade later, Dragon Bones and Dinosaur Eggs. 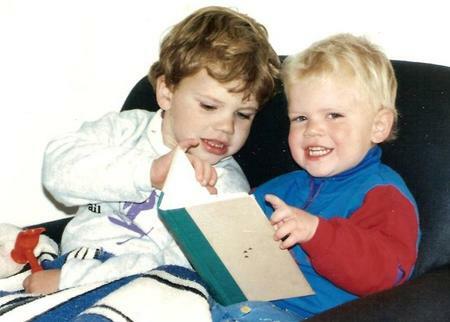 Sam (left), almost four years old, and Jake, age two, in 1992. When I was about 30 years old, I stopped working all together to stay home and raise a family. That decision changed my life. Those years as a stay-at-home mom gave me the freedom and confidence to face the challenge of breaking through the slush pile of unpublished manuscripts. I thank my sons, Sam and Jake (who reintroduced me to children's literature), for bringing me back full circle to my earliest career choice: being a children's book author. I've experienced plenty of change in the years since I began writing for young people. I don't live on a farm anymore, I'm no longer married to my college friend, and my sons have grown up and headed off for college and worlds beyond home. One thing remains constant: I still love to write books. I invite you to explore my website to find out more about my newest books, old favorites, and my writing process. Every year I travel around the country making author visits to schools and conferences. Contact me if you would like me to visit your area.